Captain Euro – Behind the Scenes! This section of the site offers a never-before seen behind the scenes glimpse into the inner workings of how Captain Euro was conceived and how is made and drawn. 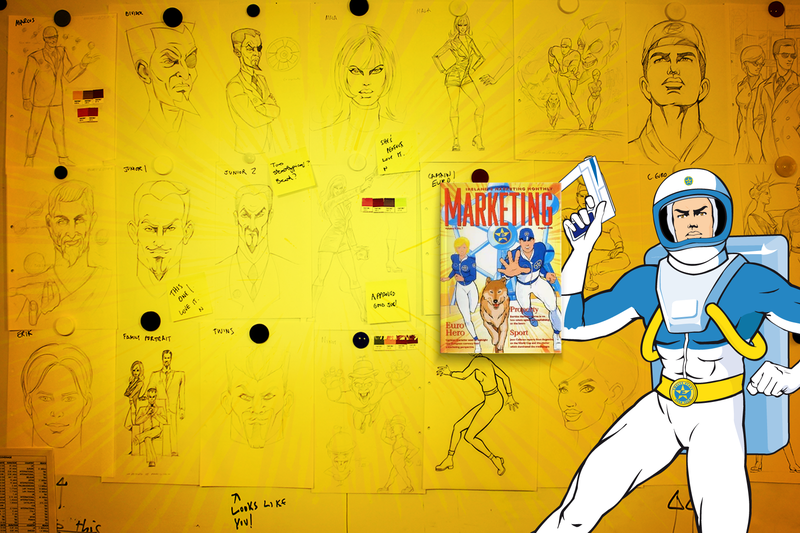 Take a look at some of the sketches and brainstorming sessions which gave birth to Captain Euro and his team, as we know them today! We will be constantly updating this section as we uncover more material from our vast archives, so stay tuned and check back for more! 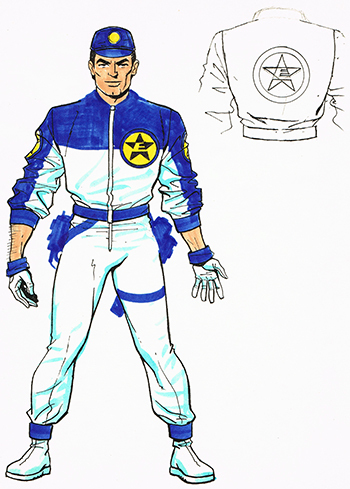 An early concept for Captain Euro, drawn with pen and felt-tip. 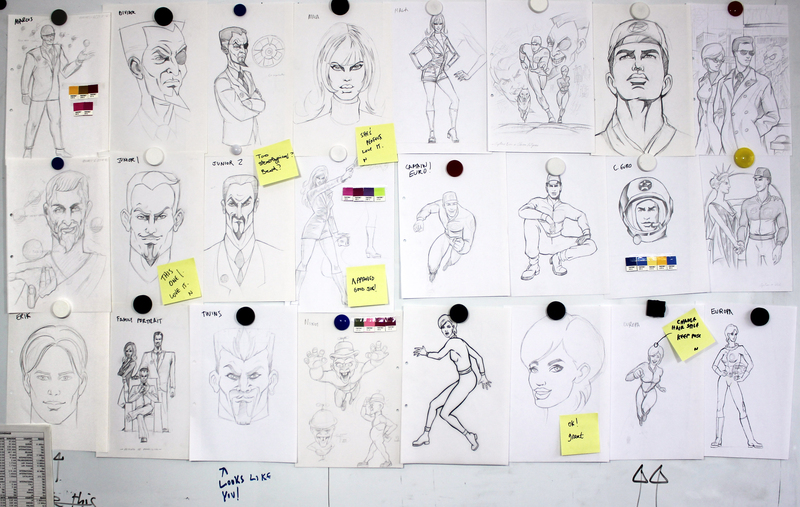 Whiteboard showing sketches for various characters in development. Many of these sessions were needed to refine the characters’ size, features, facial expressions, hairstyles, fashion styles, and colour schemes. Here is an example of the process required to develop the various characters and different poses. Here we can see development of Captain Euro in a forward running pose. From left to right, we progress from the initial hand drawn sketches to the later versions. These sketches, once finalised, would then be line traced by hand (drawing 3) in order to be scanned, digitised and then coloured (4 & 5). 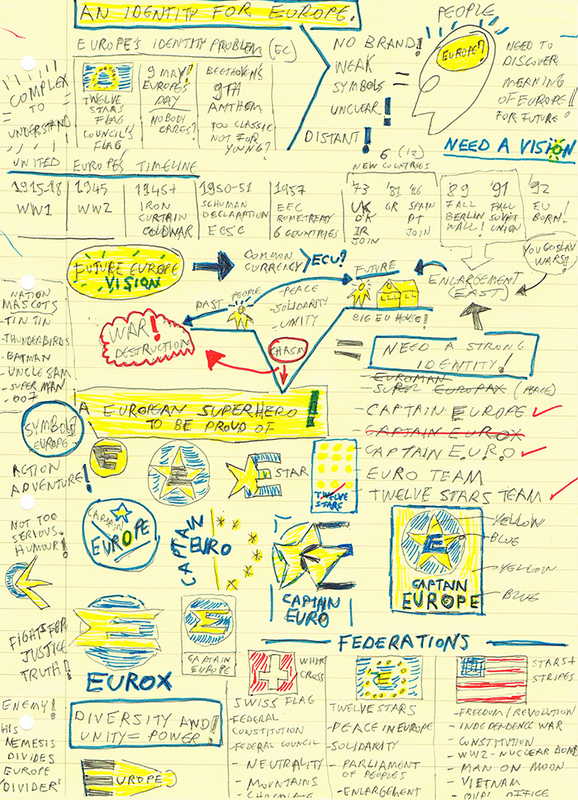 Handwritten scribbled first notes by Nicolas De Santis on an idea for a ‘Europe’s Super Hero’. In the note we can see a description of Europe’s identity problem and the need for a vision of Europe, a timeline of a united Europe (from WW1 up to 1992), a list of potential names for Europe’s superhero, and some sketches for a symbol. At the bottom we can see the EU compared to other federations like the USA and Switzerland. 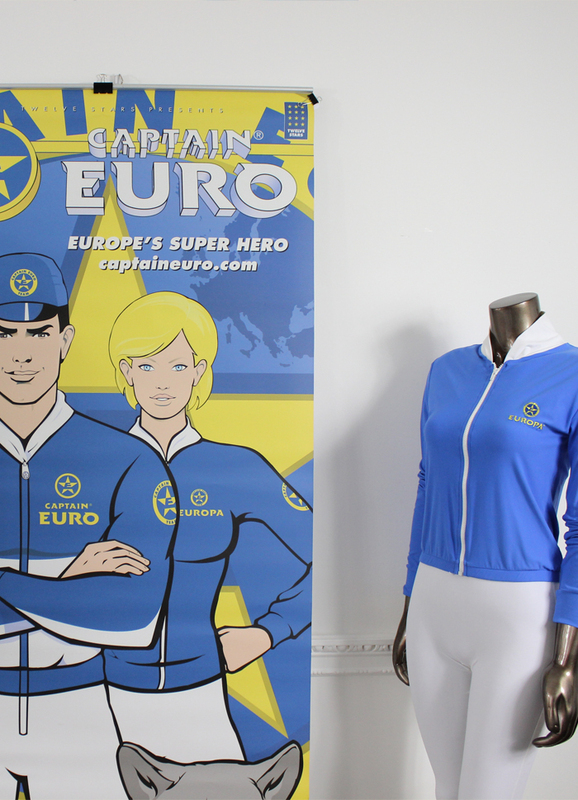 The first Captain Euro and Europa costumes developed and the room used for the casting auditions of the Captain Euro and Europa actors used for live events. A script would be provided to test how the aspiring superheroes would get into their roles. Film footage of videogame in development showing different game environments, characters and levels, including the dungeon hideaway of evil Dr. D. Vider. Enjoy! “One of my favorite bands had always been Simple Minds, ever since I heard their song “Don’t You Forget About Me” in the Breakfast Club movie. 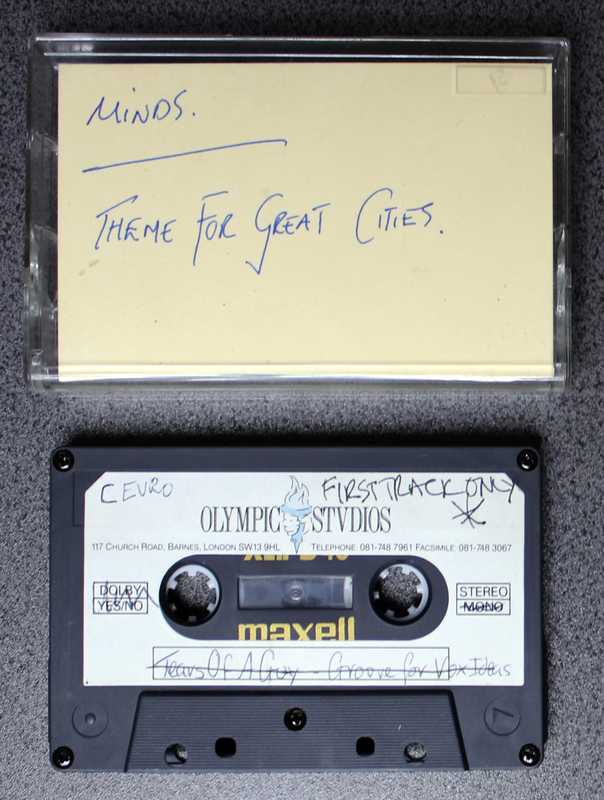 In the early stages of developing Captain Euro I was introduced to Jim Kerr, lead singer of Simple Minds, by one of our designers, who had worked with him on developing some of their album covers. Jim loved the idea of Captain Euro to promote a united Europe and he requested to meet me at their recording studios, Olympic, in Barnes. Coloured storyboard with work notes for a flash animation sequence of the “Origins” story. 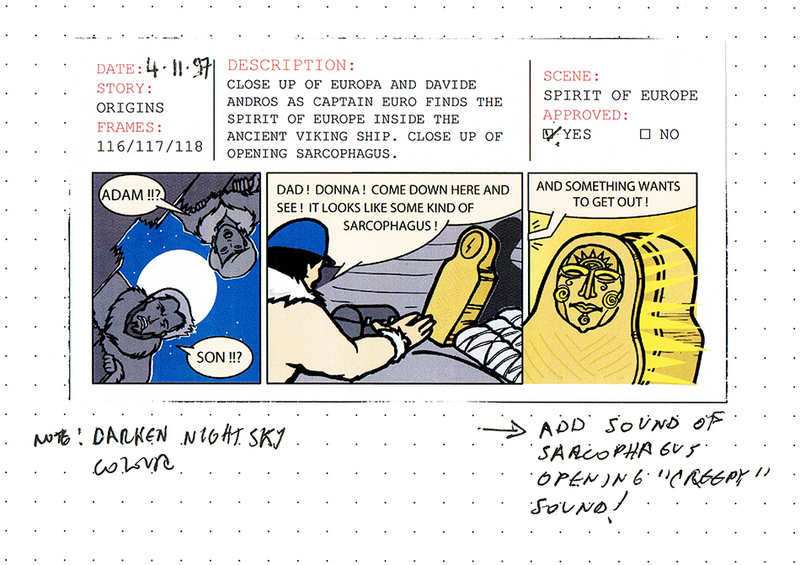 In this scene, Adam Andros discovers the sarcophagus of the spirit of Europe.